Wow, what a Book Week we had this year. We were lucky to have five authors come to visit us at Princess Frederica to work with a range of children through assemblies and workshops. There has been laughter, deep thought, enjoyment, curiosity and exploration and all thanks to the inspirational, engaging and informative visitors we have had. There was lots going on besides the author visits as well. World Book Day was celebrated by the whole school on Thursday 2nd March '17 and the children (with a little bit of help from the parents!) produced some incredible outfits demonstrating originality, imagination and creativity. 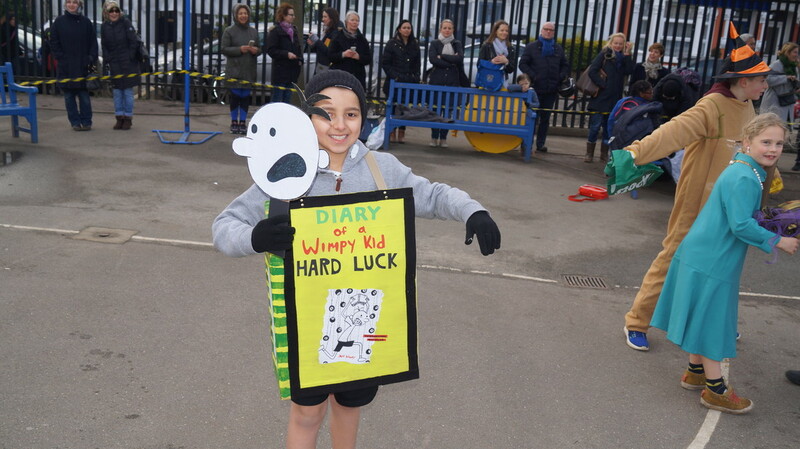 There was a school parade in the morning and this was followed up by a range of activities such as partner reading in different classes, an assembly, parents sharing their favourite stories with classes and many more. A very big thank you to the PSA who worked tirelessly to produce an incredible line up for our Princess Frederica Book Week. Their work and investment has made a great week possible. Special thanks to ​Amanda Constance, Emma Lowe, Pendle Harte and Belinda Rasmussen for their great efforts in coordinating the week. The children enjoyed watching, learning and participating in a range of activities and assemblies led by our visiting authors. There was inspiring poetry from Adisa which led to some fantastic writing to comedy including songs played using balloons from Andy. The children were engaged from the start with James and were enthralled by Cressida's tales of remote islands and gigantic sea creatures. All the authors gave valuable and enjoyable insights into what it was that made them want to write and how they get their creativity going for their writing. 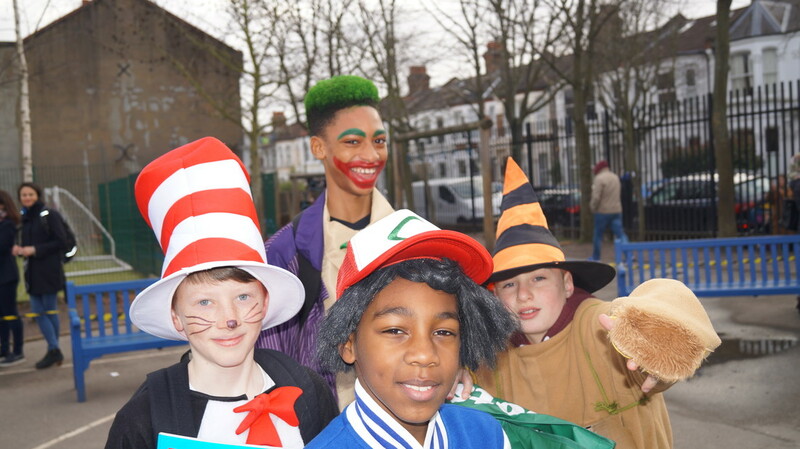 From Harry Potter to Peter Pan, Billionaire Boy to Ursula, Mr Happy to The Queen, the children arrived in the school playground for a day of celebrating. The children read, they laughed, they guessed, they chatted and they did the things they don't do everyday wearing the outfits they definitely don't wear everyday. 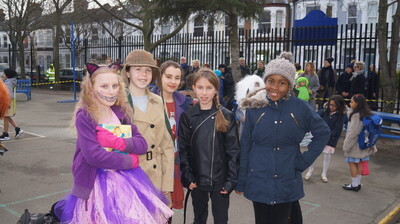 The day was all about celebrating all that is great about literature. Seeing every child with a book in their hand at some point in the day and reading in different places and at different times reminded us all about the importance of a good book enjoyed properly and shared with others. Please read on to find out a bit more about the day. The playground was filled with excitement and noise. Children talked excitedly about their creations while parents snapped away furiously on camera phones. Jaws dropped as each impressive costume was topped by the next. First there was the choosing hat, and then Ursula, followed quickly by numerous others as well as Claude on skis! The excitement and joy was great to see. Over the next half-hour, the children took their opportunity to parade in front of their parents with style. 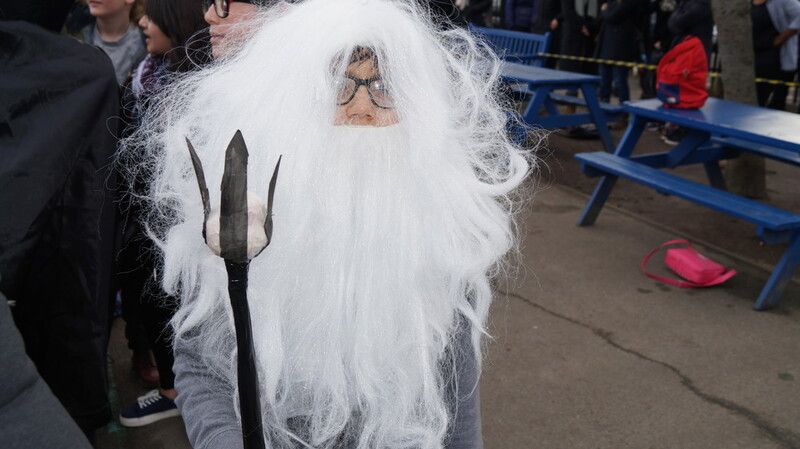 Despite the cold weather, parents stayed behind and applauded with great enthusiasm. All classes paraded and it was a great success. 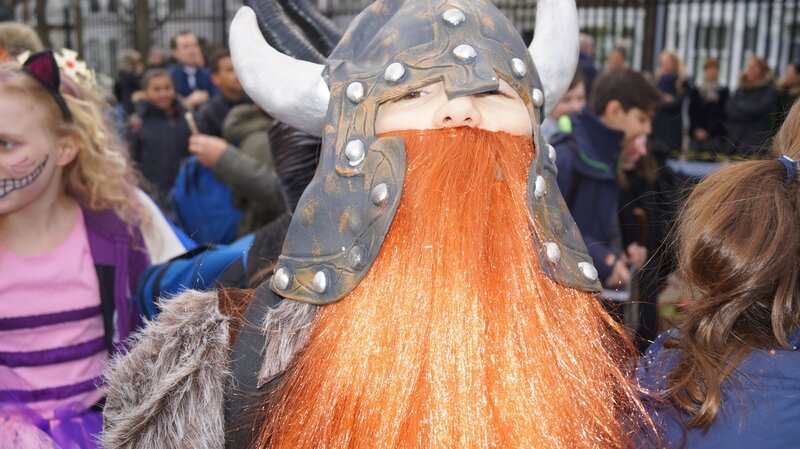 One change for next year: everyone will parade in the main playground! From 9:30am, our trusted group of judges- who were made up by Reverend Will Leaf, Reverend Graham Noyce and three different members of our school council- started the unenviable challenge of finding the best costumes on offer. There was strict guidance on scoring and the whole process was overseen by our eagle-eyed Headteacher, Ms Simpson. Soon, the results were in! Excitement reached boiling point as the school in its entirety piled into the main hall. With the finalists all collected on the stage, and with anticipation building, the winners and runner-ups were announced. This was followed by a quiz: Can you identify the book from just the first line of text. From Madeline to The Hungry Caterpillar, the children demonstrated their love of reading and books and with it, the end of a very noisy but highly enjoyable assembly. Activities for the rest of the day included reading in unusual places, paired reading with different year groups and parents sharing stories with the class. And as the day slowly started to draw to its close, the natural deterioration of costumes accelerated. 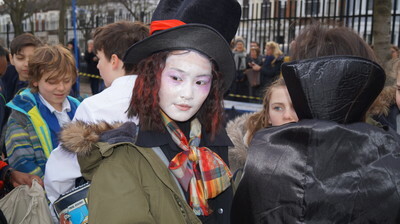 Irritating face paint was washed off, fake moustaches were lost and heavy props started to prop up walls. The children who left at the end of the day were the same children who had started it, they were just now exhausted, almost as exhausted as the teachers! 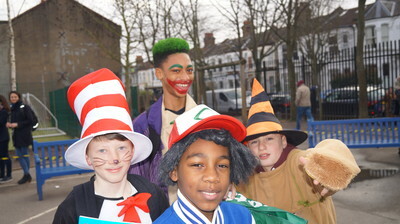 World Book Day: The Costumes! 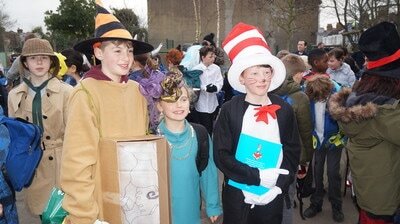 World Book Day: The Parade!